Experiencing the expedition with you all gets better and better. Mitch: your sense of humor is priceless. 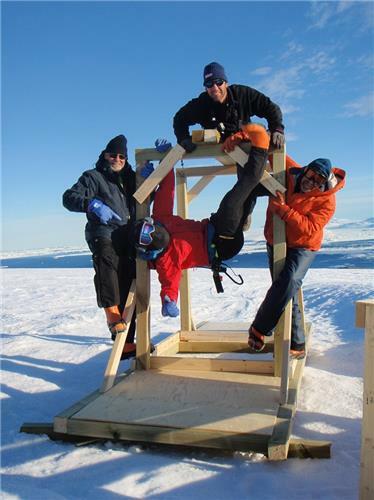 Loving this, absolutely loving this ability to live along with the Group in Greenland. Thank you! Love the "ice chips ." It's easy to imagine Rob saying just about any of those things. Nice to see you made some good progress today and you all still have a sense of humor ( well, most of you anyway). Mitch, enjoying your daily reports of the progress and the personal observations! Thanks! Keep up the good work! 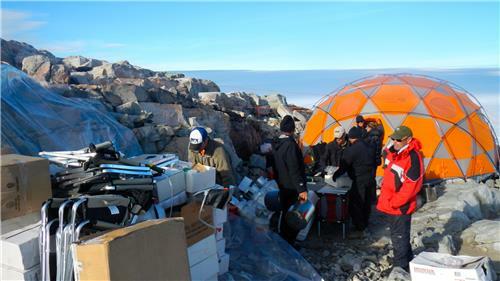 Amazing work happening there in Greenland and thank you for sharing these great updates. Boston will keep all the team STRONG during these trying days which I know are not all fun but very exciting. Can't wait to here more about the Ice Shower. Thank you for sharing, Mitchell. It's so great to see our daughter, Laurel, in action. Time to start a WEEGEE FOR PRESIDENT campaign. Thanks for all the hard work, long hours, and dedication to our troops, God bless and be safe. What an amazing blog. Was just finishing the book when Jenna Rizzo, wife of Nick Bratton, put on FB that her husband was on an adventure in Greenland. Next thing I know I'm reading about him in Frozen in Time. Finishing the book and reading this blog has been more exciting than reading Into Thin Air. I sort of feel like I'm there and wish everyone the best. Be safe Nick, so proud to know you!!! HAPPY BIRTHDAY, LOU!! I am there in spirit, to wish you the very, very, very best. You are one deserving, first-class guy. Thank you. Just finished your book, so very sad. You honor all in your quest to find these heroes. Good luck to you all. Thank you, Mitch. We know that Rob has thoroughly enjoyed his time on this mission - and the friendships he has made. As you all continue your mission, know that our sister, Allison, is watching over all of you to keep you safe. All of you are my heroes and that's all I have to say about that! 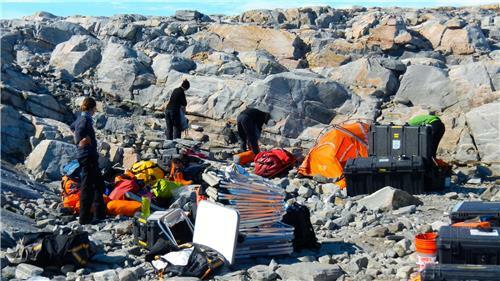 Expedition members pack up gear in advance of the piteraq storm. Emptying the kitchen dome tent before boarding the helicopters. 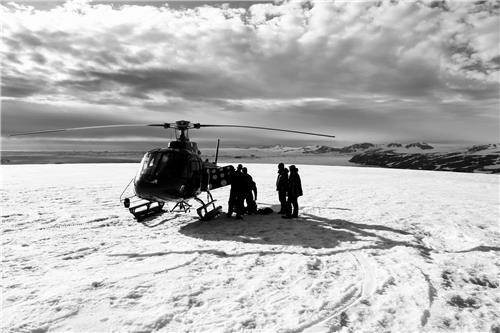 Mitchell Zuckoff guides Tom Andreassen's A-Star helicopter into the landing area. 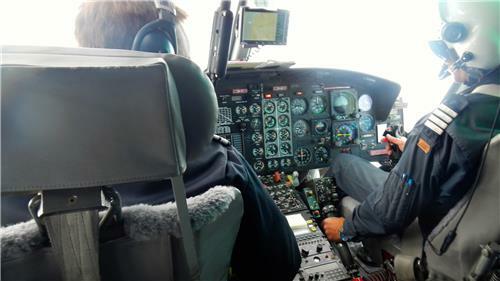 Pilots Peter Wiis of Finland and Geir Paulsen of Norway in the cockpit of the 212. 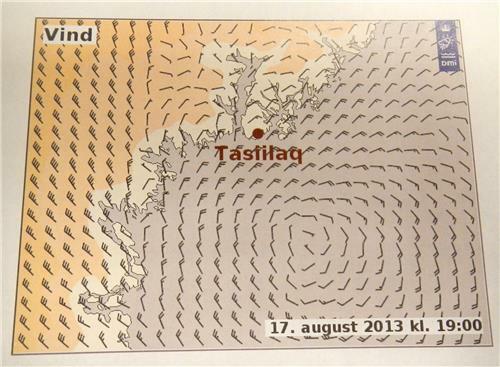 A weather map at the Hotel Kulusuk showing high winds around Tasiilaq. The forecast for Koge Bay, some 100 miles south, is far worse. 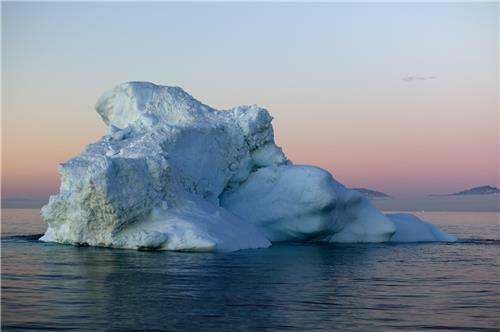 for such winds, and there’s nowhere on the glacier or the nunatak to hide. have a big job of rebuilding when we return. 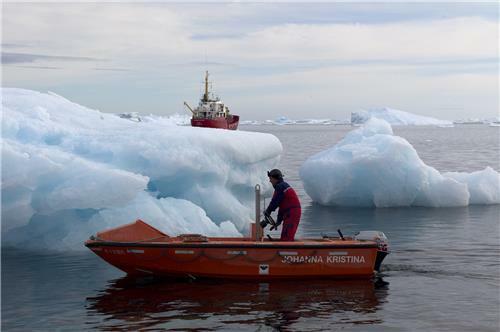 assignments was North South Polar chief Lou Sapienza. just offered to buy me another round. How could I refuse? this is exactly where we belong. 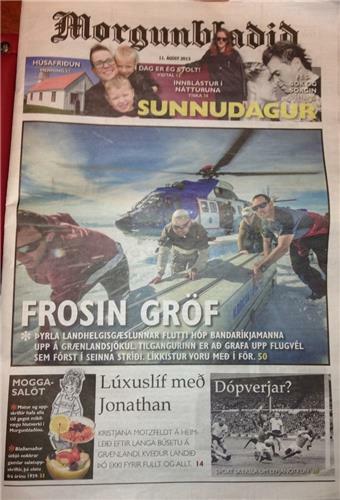 From left, Major Jeremiah Ellis, Isaac Moreno, Brian Kimball and Frank Marley on the front page of an Icelandic newspaper. 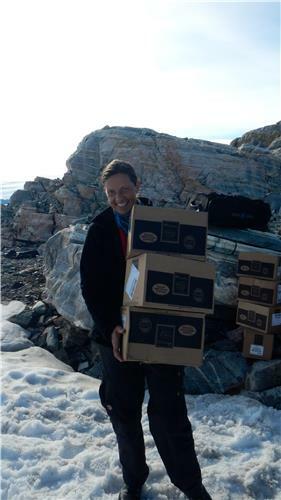 Mitch, glad you and the rest of the gang are safe and warm off the glacier for the time being! Hot shower and cold beer! Great Challenge Coin! You earned it! Was away for a few days, just checked in. Well, Greenland "laughs" as you had said. A few storms with hurricane force winds were just the beginning , but you all made it through, safely. Was v. glad you got some R&R at the Inn. Pictures and texts throughout, absolutely wonderful. I know, pressure mounting. 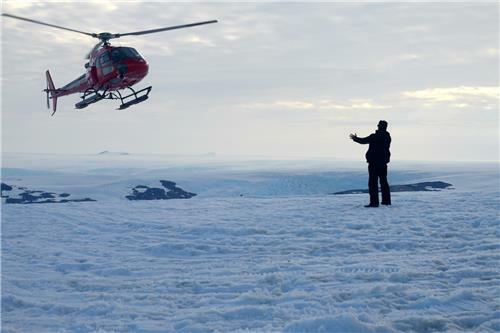 This experience is so amazing, helicopter video and all: and you have all had successes so far. With you until the very end and will keep tuning in. I've never experienced a story as it unfolds, such as this. God bless. making it impossible to tell where one ended and the other began. 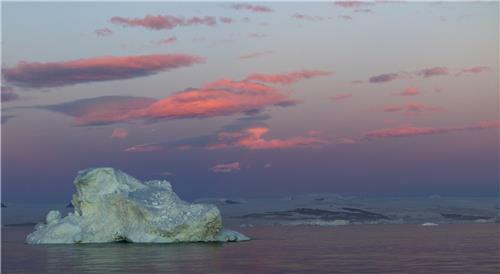 Working in milk -- the sky and the glacier appear the same color. 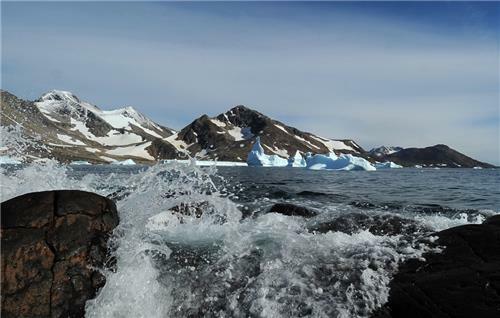 into the Koge Bay glacier. Pilots call the phenomenon “flying in milk.” During World War II it claimed numerous lives of airmen unlucky enough to experience it. We know that Pritchard, Radioman Benjamin Bottoms and Corporal Loren Howarth were among those victims because of Pritchard’s last radio transmission, in which he made a desperate plea for “magnetic orientation,” or M.O.’s, to guide him toward his waiting ship. seeking a course to the Northland. Without it, the Duck was in danger of slamming into the water or the ice cap. precautions as we moved between the base camp and the dig site, but little more. dropping, ever hopeful that the next hole will be the jackpot. name keeps us going: Nancy. learning everyone’s role and name, she thanked each team member individually. was on a cruise when we left. We’re trying, Nancy, we promise. Nancy Pritchard Morgan Krause and her husband Bill, before the start of the 2012 Duck Hunt. ICE CHIPS: We’re all Duck-obsessed, to the point where some of us have had ducks – both the waterfowl and the aeronautical kind – appear in our dreams. But it reached a new and disturbing level yesterday. While changing boots in my tent, I could have sworn that I heard a distinctive quack-quack sound. I shook it off, knowing that my hearing isn’t great, and there are no such birds within hundreds of miles of here. Then I heard it again. When I emerged from my tent no one was around, so I worried that I’d be accused of glacier madness if I asked if anyone had heard something strange. Alone with a few friends in the base camp dome, I summoned the nerve. They broke into big smiles: safety leader John Bradley had sounded a hunter’s duck call he has on his iPhone. I don’t know how, but I’ll get him back. Mitch, still hope for successful recovery of Duck & Crew. 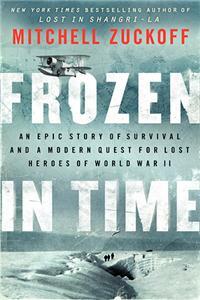 Holding review of Frozen in Time in anticipation of such. So glad you are all safe !!! 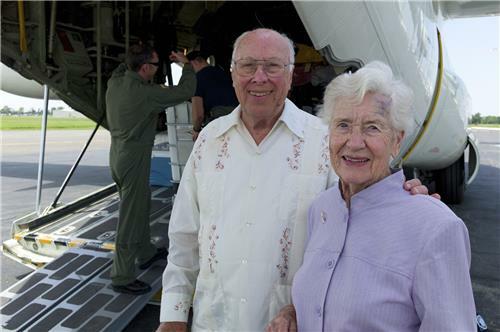 Best of luck on the rest of the mission - please tell Mindy that Gail and Keith love reading the blog !!! John and I read your blog every day. Know that you are all in our thoughts and prayers for both your safety and your success in finding the Duck. Mitch, your writing is superb, as usual. Looking good out there on the ice, Andy! More fun than sitting on the hangar deck, i bet!! Reading about the daily progress in real time is very exciting; also a little scary - crevasses, guns and bears, oh my! You are all so brave. Keep up the good work. Hoping for success. Stay safe. Love the Ice Chips sounds report. I can almost hear the symphony from here. Wish I was there to lift the boiling kettle and have a cup of tea with you. Great job on the blog, Nicholas. Can't wait to hear your stories in person. Thanks for keeping us updated Nick. I hope all the winds die down soon. Yes, Brian Horner does bring good luck everywhere he goes! I should know, he is my big brother! Keep up the good work all and give my brother a big hug for me. Thanks for the "live" update Nick. I've heard that fortified walls work well against the Piteraq. My son Major Jeremiah Ellis might like to hear about the weather here in Iowa. We have had record breaking temperatures this week. Temperatures have been in the high 90's, even broke, 100. Sounds like you could use some warm and we could trade for some cooler temps from you. Great read... Wait with baited breathe every day... Such commitment, determination, and perseverance. Hats off to the group... Job well done!! You should all be so PROUD!! resume our activities at the dig site. backs labored to free our fuel drums from their icy imprisonment. with our trash and some Hotsy pressure washer parts for repair in Kulusuk. 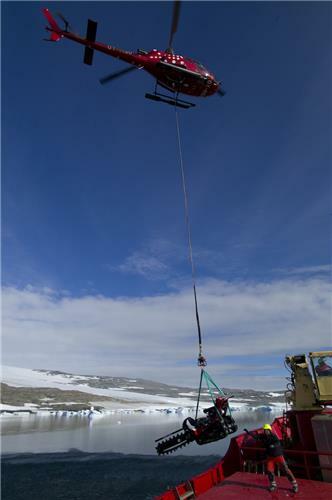 Meanwhile, reprising her original role with North South Polar, geophysicist Jaana Gustafsson patrolled the glacier with her ground-penetrating radar to expand the survey area. Anthropologists Mindy Simonson and Dr. Laurel Freas explored two new holes with the camera as persisting winds scoured the dig site with airborne ice crystals. A new construction project arose from adaptations to our search tactics. In consultation with master mechanic WeeGee Smith, the anthropologist team decided yesterday to attempt to locate more conclusive evidence of the aircraft using a new approach. WeeGee would expand an existing hole to a four-foot diameter and descend into the depths of the glacier to investigate a point of interest. In order to accomplish this feat, WeeGee proposed construction of a gantry – an elevated frame from which to lower him into and retrieve him from the glacier with rope and pulleys. North South Polar revealed its latent engineering talents, taking WeeGee’s concepts and seizing power tools with gusto. We measured, sawed, and bolted throughout the afternoon, finishing our sturdy structure moments before the call for dinner crackled over the radio. The gantry and hole would be covered by a dome tent, allowing WeeGee to operate in inclement weather. The photo shows Project Manager Joe Tuttle joined by Safety Team Leaders Nick Bratton, Frank Marley, and Brian Hornerdemonstrating the strength of the finished product. visit to repair some Hotsy components. especially in the wind at 2 a.m.
replacement sleeping bag Isaac has returned his tent to its stylish state. 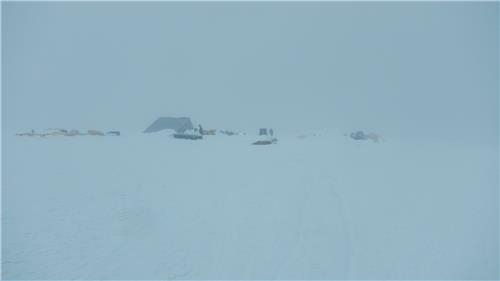 rushing to strike camp on the nunatak. freezing rain. Or maybe snow. They weren’t certain. But the forecasts agreed: something was coming. hotel, each flight arriving two and a half hours after the previous. And naught a spot of greenery. Within the frigid glacier cover? And taste the Mountain House’s savor. Down our necks piteraqs were breathing. Crushed several tents in ferocious gale. How could our tiny band prevail? Of ice meandering with glacial motion. These heroes from a distant war. review photos and post a selection taken in the preceding weeks. They tell their own stories. souvenir shop, returning with a sculpture made from a whale’s tooth. views from the summit were spectacular. Mountain House to new culinary heights. 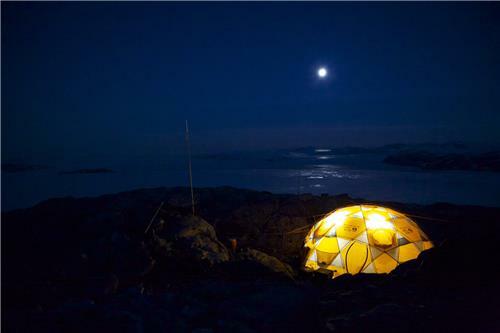 we have learned that Greenland has its own way with our equipment. 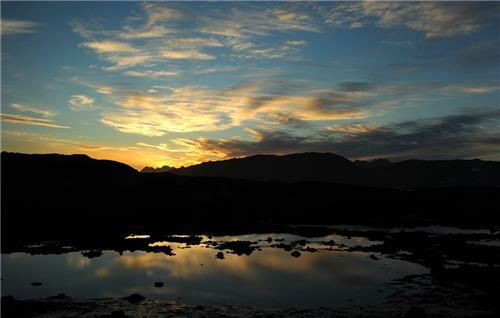 Thanks to all the loyal readers who have been following the adventures of our expedition from around the world. We appreciate your comments, encouragements, and well wishes. Knowing that you are supporting us from afar helps us keep focus on the job at hand. We’re going to need all the help we can get as we enter the final leg of the mission. While the winds are predicted to ease off later this week, our return to the ice will be greeted with a few days of freezing rain. But until then, there is more sun to enjoy in Kulusuk. 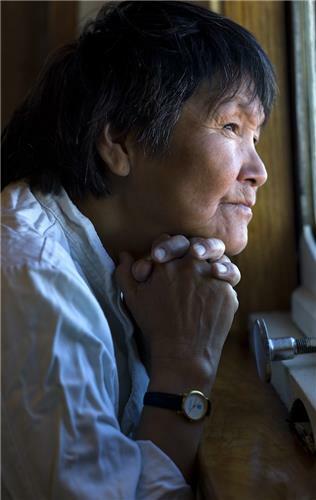 Geophysicist/epicurean Jaana Gustafsson, who personified the can-do effort of the North South Polar team. Best of luck to everyone returning to the ice today. Still loving all the updates. Keep up the good work on the blog Nick and all of you for your determination to find the duck and the three lost heroes. Stay Safe!! I second that! Be safe.